The Bosch Carephone 62 and Fall Detector Watch is designed to help you maintain your independence, providing aid if a fall occurs. Holding onto our independence as we grow older is important. But we face different challenges as we age and there is a difference between being independent and being alone. We want to know that if we need help, it will come. The Bosch Carephone 62 helps provide this reassurance. By connecting to a twenty-four hour monitored call centre, help can be given at any time of day by just triggering an alarm. The Bosch Fall Detector Watch is an ideal sensor to match with the Carephone 62 and alert someone to a fall. For your convenience, the Bosch Carephone 62 and Fall Detector Watch is now available as a kit to ensure you have everything you need to retain your independence. The Carephone 62 is an economical carephone with the ability to run from analog, IP or GSM telephony technology. Programmed through the use of SD card, there are no installation complications when setting up the phone. The alarm can be triggered from either the carephone or the watch. This is then transmitted to a staffed centre, where both the person and the alarm type can be quickly identified. The two-way voice communication allows the situation to be assessed and the appropriate action taken. 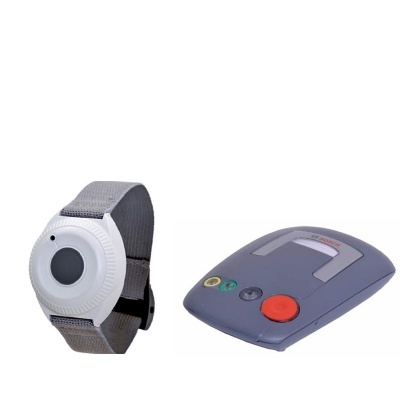 Designed for carephones such as the Carephone 62, the watch has two different modes: help and fall. While help is manually triggered by pressing by the button, the fall mode is triggered when a period of inactivity is detected after a significant impact. If the watch is then moved, the alarm is cancelled, helping to reduce false alarms. Operated by a 3V lithium battery, the alarm is both waterproof and hypoallergenic to ensure maximum comfort for everyday wear. The Carephone 62 and the Fall Detector are designed to work together. They are not compatible with other products. The Carephone 62 conforms to the protection class IP32.